Should you buy one bearded dragon - or do they need company? Overbreeding will shorten her life considerably. A male beardie may well reach sexual maturity long before the female, and breeding too young may have very serious consequences for her. The chances are good that if you buy two beardies you may need to separate them - if they have become family pets you won’t want to part with either of them, which will mean two vivarium set ups. Before buying more than one beardie do consider what you are going to do if you find you can’t keep them together. You may buy two females which turn out to be to be males, or a male and female, so will need to have a spare vivarium or a back up plan (e.g. An arrangement to take one back to the breeder or pet shop) if one shows its male features. MyBeardedDragons website contains information for the new owner on how to keep a bearded dragon properly so that it is happy and healthy. An active forum dedicated to bearded dragons gives advice and support to new and experienced owners. One Bearded Dragon or Two? And the answer is that in their natural habitat bearded dragons are solitary creatures, and only pair up to mate. Once the mating has taken place male and female go their separate ways again. The female will lay her eggs in a burrow, cover them to keep them safe and then move on and forget about them. If she was to come across one of her hatchings she would treat it as food. They are not social creatures, so why do we insist on thinking they need company? Unfortunately it is because we are transposing our human feelings on a completely different animal. Although often only between 5 and 8 inches in length in the shop and very appealing, many people make the mistake of thinking they will stay that way for quite a while. They don't. They grow fast, and one adult beardie will require a 4ft x 2ft x 2ft vivarium normally well before it is six months old. You can, just about, house a pair of beardies in this size of viv, but more space is better. Keeping more than one beardie together is unnatural, and any new owner wishing to try to keep more than one must be aware of this, and be ready to separate at the first signs of any trouble - this really means having a separate vivarium handy. Keeping two males together is just not going to work, and the first fight they have might be the last for one of them. If you are thinking of keeping a bearded dragon please think carefully before falling in love with all those attractive looking baby beardies. One question that I am asked a lot is whether you should buy one bearded dragon or two, and if more than one, what sexes go together? When setting up the vivarium we try to mimic their native environment with regard to heat, lighting and decor. We should also look at how bearded dragons live in the wild when considering whether to have just one bearded dragon, or whether they need company. 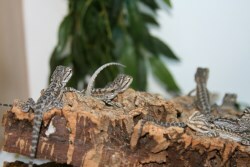 Baby bearded dragons are very appealing, and look like they enjoy the company of their brothers and sisters! An adult male bearded dragon can be 22 inches in length. It is, unfortunately, not unusual to see pet shops selling bearded dragons in pairs. Regrettably pet shops - and even some so called reptile centres - do not understand bearded dragons and are certainly not experts in their husbandry. Sometimes breeders have difficulty selling all the hatchlings, so will offer a pair at a reduced price. Or sometimes people want to try two bearded dragons, either because they are thinking of breeding at some point, or because they have two children who want one each. If you really want to have two, you should try to go for two females - these will probably get along. But there is no guarantee. The main problem to consider is that whilst it is fairly easily to spot a male from a few weeks old, a beardie that looks female could be a late developing male, and you can’t be certain for six months or even more! If you end up with a male and female you may need to separate them if you are buying two from the same clutch or the same vivarium in the pet shop you will probably end up with a brother and sister, and obviously you don’t want to breed from them! Even if you keep an unrelated male and female together it won't be a case of you deciding whether to let them breed, males are normally very sexually active, and may dominate the female causing her a lot of stress. 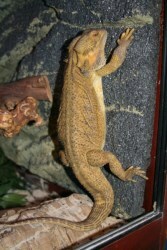 It is not hard to breed bearded dragons - in fact it is almost too easy! But be on very friendly terms with your bank manager before you enter into this. Bearded dragons lay large clutches of eggs, and usually more than one from one mating. The feed bill can be up to £50 per week, and you need lots of vivariums to house the babies until they can be sold at six weeks. There is very little profit in breeding beardies, unless you have exceptional coloured morphs. Obviously if you read my site you’ll know that I went for a male and female, from different parents. Shrek and Fi were put together by their breeder when they were only days old so they have literally been together all their lives. Whether this has helped, or whether they have just generally placid natures I don’t know, but so far I have been lucky in that they only mated twice in nearly six years and Shrek does not bother Fiona - if he gets a bit excited she just goes onto her hammock! Neither seemed to dominate the other, and there seemed to be no competition for food. I was always aware that I might have needed to separate them at some point, but in the end I didn't have to. When Shrek died I was very worried about Fiona losing her mate, but I needn't have done so. After nearly six years of living with a male Fiona blossomed. Her colours got much brighter, and she put on weight. She is a much happier and contented bearded dragon on her own, even though I thought she was happy and healthy with Shrek. Would I buy two together again? Knowing what i know now, no. The risks are too great. If the reason, like mine, was to provide company for each other, the best course of action is to buy just one, and you provide it’s company!